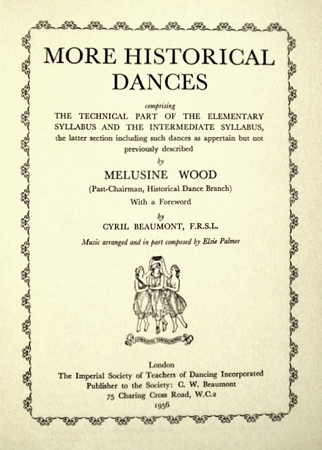 Information: Melusine Wood, author of books about historic dance. Advanced Historical Dances. Wood, Melusine. London: Imperial Society of Teachers of Dancing, 1960. Information about dance from the 15th to 18th centuries. More Historical Dances. Wood, Melusine. London: Imperial Society of Teachers of Dancing, 1956.